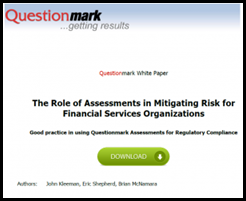 Can testing show commitment to compliance with regulations? Almost every day, you can open the financial pages of a newspaper and see a new compliance failure – another company fined multi-millions for breaking regulations. How can an organization develop a culture of compliance? Prosecutors should therefore attempt to determine whether a corporation’s compliance program is merely a “paper program” or whether it was designed and implemented in an effective manner. … prosecutors should determine whether the corporation’s employees are adequately informed about the compliance program and are convinced of the corporation’s commitment to it. Obviously, commitment is commitment, and you can’t fake it. Executives and managers need to genuinely believe that compliance with regulations is important and exhibit appropriate behaviour. Aon Ltd should have ensured that appropriate members of staff – particularly those in the Aviation and Energy divisions – received focused training in relation to this area and were tested on their understanding of the relevant risks involved. Effective training and testing in this regard would have emphasised to staff the importance of carrying out effective due diligence prior to authorising an Overseas Third Party for payment.